Stornoway Diamond’s Renard diamond mine in north-central Quebec. Source: Stornoway Diamond Corp.
Stornoway Diamond Corp. [SWY-TSX; SWYDF-OTC] on Tuesday April 9 said it has decided to suspend open pit operations at its Renard Mine located about 250 km north of the Cree community of Mistissini and 350 km north of Chibougamau in the James Bay region of north-central Quebec, which will reduce operating costs. Stornoway said the mine still has sufficient stockpiles to meet plant throughput requirements until the second quarter of 2020, partly on the back of higher-than-budgeted ore tonnages from the underground mine. “As such, no effect on revenue in 2019 is to be expected,” the company said in a press release, Tuesday. Meanwhile, the company said the processing plant underperformed in the first quarter of 2019, but improved to 7,200 tonnes per day in March. This was above nameplate capacity of 7,000 tonnes per day. Management expects this performance to be sustainable, meaning that the shortfall can be made up over the course of the year. 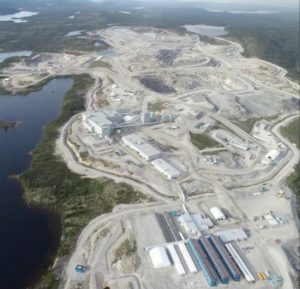 Renard is Quebec’s first producing diamond mine and Canada’s sixth. Construction on the project commenced on July 10, 2014 and commercial production was declared on January 1, 2017. Average annual diamond production was forecast at 1.8 million carats per year over the first 10 years of mining. Stornoway President and CEO Patrick Godin recently said 2018, the second year of commercial production, was one of transition from open pit mining to primarily underground mining. “This transition proved to be challenging, but our team overcame the difficulties we faced, safely and successfully completing the ramp up of the underground mine in August,” he said. In the 2019 first quarter, Stornoway sold 429,506 total carats in two tender sales, generating gross proceeds of $47 million at an average price of US$83 per carat. In terms of total carats sold, pricing and gross proceeds, this represents increases of 38%, 8% and 47% over the fourth quarter of 2018 respectively. First quarter diamond sales represent diamonds recovered during the fourth quarter of 2018. Fourth quarter diamond production was 444,562 carats recovered from the processing of 582,613 tonnes of ore at an average grade of 76 carats per 100 tonnes. Carats recoveries decreased by 8% compared to the fourth quarter of 2018, principally due to mechanical issues at the front end of the process plant related to cold weather in January and February. In March, the process plant surpassed its budgeted daily rate with an average of 7,209 tonnes processed per day. Stornoway is facing a liquidity shortfall this year unless diamond prices recover from current levels. On Tuesday, the company said its streamers and secured lenders have agreed to a modest relaxation of the minimum tangible net worth covenant which had recently been flagged by management. Stornoway shares were unchanged at 10.5 cents on Tuesday. The shares trade in a 52-week range of $0.09 and 59 cents.